Download the complete user manual here. Step 1: Charge for at least 1 hour. Step 2: Install the Podo 5MP 2016 app. Step 3: Rotate back flap and remove protective film on sticky pad. Step 4: Stick securely to a wall and use the app to shoot! and the iOS app here: podolabs.com/ios. 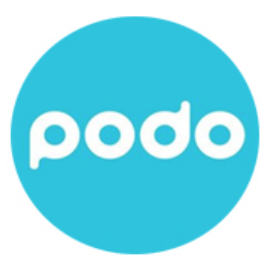 Follow directions in the app to connect Podo to your phone. The sticky pad allows Podo to stick to surfaces. While the sticky pad provides temporary adhesion to surfaces for quick shots, it is not intended for permanent attachment. Step 1: Ensure pad is clean and dry. Pad should feel sticky to the touch. Step 2: Press Podo on surface with pressure. Podo sticks best to smooth, solid surfaces. Step 3: Nudge to test that Podo is secure. Podo should feel solidly stuck, otherwise clean pad or try a different surface. Step 4: Podo is designed to adhere temporarily and may detach on its own over time. Stick Podo on glass for more secure and lasting mounting. Step 1: Wet finger with water and wipe sticky pad carefully until free of dust and foreign material. Do not use soap. Podo is not waterproof. Step 2: Pat dry or use an automatic dryer. Heating the sticky pad with a dryer will increase its stickiness temporarily. Step 3: You can also use scotch tape to lift dust off the pad directly. *Caution: Wet paint, oils, and other chemicals will harm the sticky pad. In these cases, wiping the pad with rubbing alcohol may reverse some damage. Podo’s light ring is always active when Podo is on or recording. Podo will take photos in landscape when 4 LEDs are horizontal and portrait when they are vertical.